We can’t hope to understand where we are now, nor competently steer where we head next, without understanding where we came from and how we got from there to here. This spread has been in my back-pocket for a long time. It’s another one I use generally that I believe has value to resistance and shadow work. Our problems are not new, they’re just loud and ugly, and more people are starting to pay attention to them. The worst things we face now—bigotry, fascism, hatred, brutality, colonialism, war, genocide, greed, the unsustainable violence we’ve done to our planet, and the hard consequences of all these things and more—all have deep roots in this country and the world. We can’t change our ways and heal, or even damage control, without tracing the roots of our ailments and taking responsibility for our history. Now tarot is a limited tool. We’ll only get so far through this exercise alone. This is an aid, not a substitute for the depth of thought and research we need to understand complex, systemic social, political, and historical patterns. It’s not enough, but I do think tarot has value as a guide for social rumination, given its rich archetypal imagery, and given that we each have unique questions and interests within this epically broad field of inquiry. There’s so much ground to cover, no one person can think all the thoughts or read all the writings, and no one wants to. By necessity, we specialize within niches, even with hobbies and personal questions. Reading tarot as a prompt can provide a shortcut to the trail of breadcrumbs with your name on it. Use this spread to reflect on the big questions about philosophy, our patterns, and our collective nature. Let it be a research guide, pointing to areas worth investigating. For instance, the King of Swords might inspire you to look at military history; the reversed Wheel might point you towards the crucial, chaotic tipping points of a particular time period; and the Six of Cups might point you towards your own childhood, or the role that nostalgia for an ever-re-imagined “good-old-days” plays in our culture. 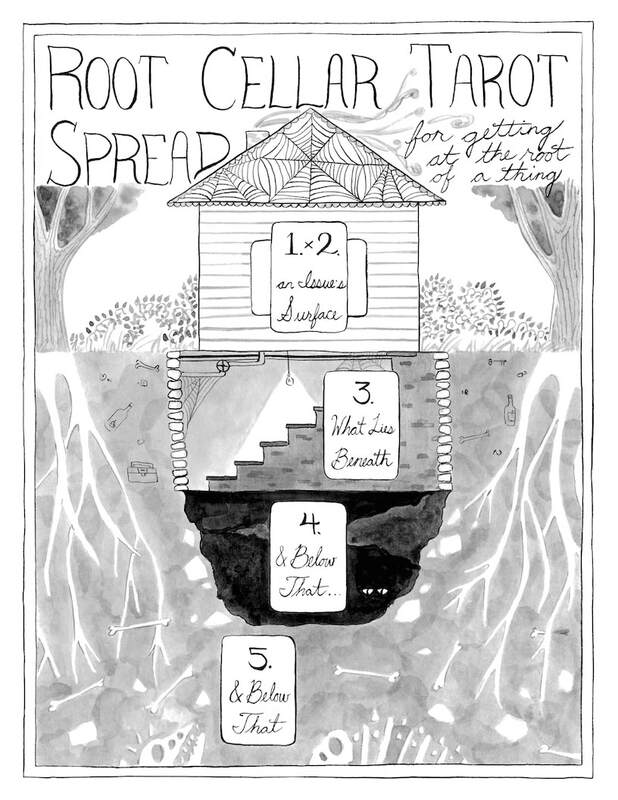 This spread’s structure is deceptively simple: look at the most visible, current face of an issue, then go digging for what lies beneath it. I chose a cross for the surface of the issue because I assume most patterns worth looking at here are complex enough to be described better by an intersection than a single archetype. Take your root cards one at a time, and consider how each story bleeds into the next. What kind of transitions do you see between the cards? Major, polar, thesis-antithesis-style shifts? Gradual, overlapping steps along a steady trajectory? Note any numerical or elemental patterns, such as repeating numbers or suits, or ordered patterns like ace-two-three, nine-eight-seven, or two-four-six. Once you’ve considered each root card from top to bottom, and looked for overall patterns, trace your story back up from the deepest root card to the upper surface. Think about the story in your reading playing out over a linear timeline from past to present. Then cut the linearity and think about how all the cards would interact if present and active at once. Assume that all these elements and stories are still in play today, and meditate on each root archetype’s current manifestations. You can draw as many root cards as you like, but I find that three usually gives me more than enough to chew on in a single sitting. If you choose to keep digging, check your mindset and focus as you go. Tarot can be addictive, and it’s easy to get caught drawing card after card without seriously thinking about them. Make sure you’re continuing from a place of genuine inquiry, and not just fidgeting. Mind your body and take a break when you start to get tired or hungry. Most surface patterns run deep, especially by the time they’ve become Problems. This spread is designed to prompt deep reflection, not to uncover quick solutions, and it may leave you with more questions than you started with. You can always jot down what you draw today, and keep digging on the same questions in future sessions. The element earth dominates this spread, particularly earth’s underground side. Our mission is to uncover an archaeology of story, so our goals take on a chthonic flavor. We dig for solid truth and facts, but in the past, beyond and beneath our own terrain, in the dusty and occluded realm of bones, ghosts, artifacts, texts, and memories. All fours elements have something to say within this spread. History is shaped always by the full range of human experience, and thus by all four classical elements: passion/spirit, emotion/subconscious, thought/reason, and body/matter. That said, if I had to choose a secondary element to guide this spread, it would be water. What subtle feelings, and subconscious tugs have shaped and permeated the clay we muck through? What role have emotional drives, desires, and mythologies played in fossilizing, crystallizing, eroding, moving, and obfuscating the narratives we carry from one time to another about events we can no longer access directly? These elemental resonances hold whether examining personal memories, or broader, collective histories. • Surface Cross Variations: I read the horizontal cards in crosses as upright, but as always, you may designate a direction to indicate reversals. You may also simplify the center cross to a single card. That might be easier for beginning readers, or for questions about broad archetypal patterns adequately represented by a single card. Draw your surface card(s) at random to gain fresh insights on the issue’s current manifestations. Choose your surface card(s) consciously before shuffling and drawing your root cards to set an intended focus for your reading and represent your prior thoughts on the issue you plan to examine. • Something Old Something New: Try drawing this spread with two decks if you have them, one contemporary, and one classic, like the Rider-Waite Smith, or better, a Marseilles, Visconti-Sforza, or other historical reproduction deck. Go for the oldest imagery you have in your deck collection. Tarot has evolved quite a bit over time. First, draw the spread with your contemporary tarot deck, then pick out those same cards, or their closest counterparts, from your antiquated deck and lay them out in the same arrangement. As you interpret your reading, compare the imagery from the two decks. Which titles have changed and which remain the same? How has the artwork evolved over time? How are old archetypes expressed in current artwork? How have the hierarchies between the cards shifted? Are there current cards that don’t have a historical counterpart at all? Trace the roots of the tarot archetypes themselves in Western history and culture. How do the stories of those shifting archetypes color and inform the story told in your reading? • Creativity: Generate history, complexity, and backstory for the characters and worlds of your creative projects. The root cards can stand for motivations, aspects of identity, life events, phases in a character’s growth, ancestors in a character’s family tree, monarchs in a dynasty, historical events on a world’s timeline, and more. The obvious application here is fiction and fantasy writing, but this exercise can apply to the visual and performing arts and crafts as well. It can be particularly helpful in fine art and illustration to imagine histories, narratives, and complex identities for your subjects and figures. Even if only a fraction of what you imagine makes it into the final image, this process can breathe life into your compositions, inform the symbolism of background details, and lend your subjects a sense of inner mystery that hooks the viewer. The animist painter might go a step further, including the same level of character building for landscapes, architecture, and animal, vegetable, and mineral subjects as for human figures. ​• Career: When we think about career, we tend to fixate in a forward direction, but it can be helpful, especially during turning points, to review where we’ve already been and what we’ve already accomplished. Let Cards One and Two represent where you’re at now and the career questions at the front of your mind. Draw root cards for key moments in your past, which may contain relevant lessons with hindsight. If young in your current career, root cards may reference lessons and events from school or other areas of life, rather than the workplace. Consider the story your root path tells from the bottom back up, and the transitions between each card. These may tell you something about your trajectory. Optional: draw a final card above your surface cross, representing something to move towards or look into for the near future. • Relationships: Gain insight on the history of a particular relationship, reading the root cards as events, phases, and shifting dynamics between you over time. Gain insight on your relationship history within a certain area of life, like work, family, love, or even housing. (Some of us have very interesting histories with former roommates!) In this case, the root cards should represent events, people, and dynamics from multiple past relationships. Note how each card interacts with the next in sequence. The cards might fall in order of psychological weight, or relevance to your current situation, rather than chronological order. For instance, you might draw the following: Card Three marks a breakup from ten years ago, with a partner who reminds you of a current love interest; Card Four marks someone you dated for two months last year, but left as soon as they initiated a pattern similar to the one that broke up your relationship from Card Three; Card Five marks your high school sweetheart, to whom you’ve subconsciously compared every love interest since. The cards may skip across times, personalities, genders, and depths of involvement, but each card has something interesting to say to the next. Optional: draw a final card above your surface cross, representing something to move towards or look into for the near future. This could be a set of qualities to look for in a new friend, partner, boss, or roommate, a positive dynamic to aim for in your current or next relationship, or a recommended boundary to set to improve your relationship health.